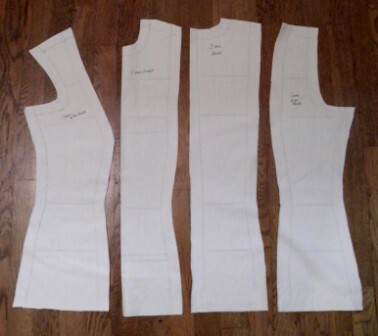 Remember when I cut out 6 shirts for my husband before heading to a sewing retreat in March? What in the heck was I thinking?!?!?! This week I decided to get in gear and finish up the 2 that I started while at retreat (yes, including the one I put one sleeve in WRONG 3 different ways!). 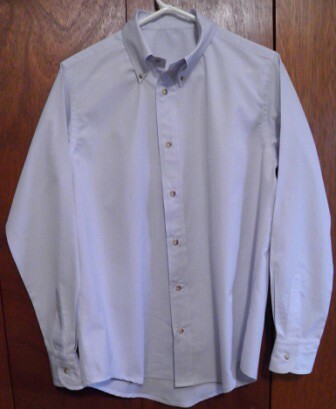 Men’s dress shirts are a lot of work. People always ask me how many hours it takes to make one, and honestly, I try not to calculate that figure. A lot. More than 5, less than 10 if I don’t screw up too much. 🙂 Shirt-making is fiddly. There is lots of pressing throughout the process. Lots of topstitching. Lots of buttonholes. Lots of buttons to sew on. There is also a lot of satisfaction from making a “technical” garment that fits my husband perfectly, looks as good or better than any RTW from Nordstrom’s, and he is super proud to wear. The process appeals to my left brain, so I keep making them. 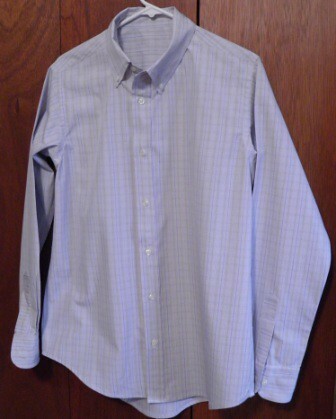 This one is a lovely, slightly textured pale blue shirt with a tiny white diamond pattern and a very narrow, brown vertical stripe. Quite dressy for a techie head who sits in his office much of the day crunching numbers and data! 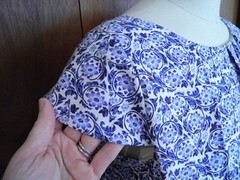 I LOVE the David Page Coffin method for making sleeve plackets. I know some people complain they are too much work – but I love the way they turn out and I don’t find them hard to do at all. Look at those buttonholes on the shirt collar – nice! 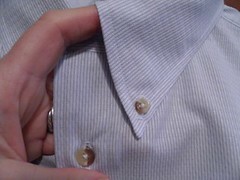 I changed my collar pattern so that the under collar is “cut on” to the upper collar. I will do a tutorial about this sometime to explain the whole process, but it results in no seam at the front edge of the collar, and therefore much less bulk in the collar points. Hence, the ability to get REALLY close to the point to make a tiny buttonhole for DH’s buttondown collar. Only 4 more to go! Happy sewing! I think half of my friends in ASG have made a tee shirt using the new “pre-ruffled” knit fabric available in lots of fabric stores, so I had to get on the bandwagon too. 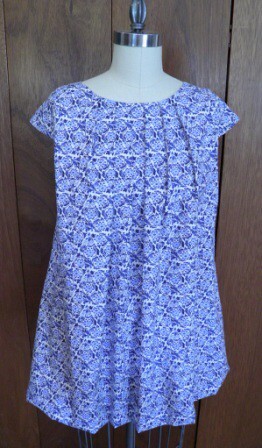 I am reasonably happy with it, especially as a quick little summer tee. 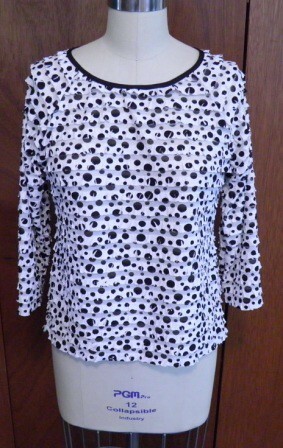 I used Kwik-Sew 3263 (OOP) – a basic raglan sleeve tee with a fairly wide, almost “sabrina” neckline. 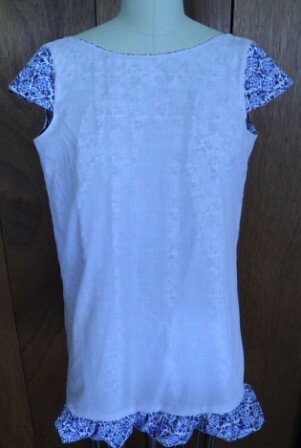 I was a little concerned the neckline might be too wide before I added the trim…but it is fine. What bothers me is the base fabric the ruffles are attached to is kinda, well, sleazy. I decided to lettuce edge the sleeve and shirt hems since I thought that would be complimentary with the ruffles. Makes sense, right? 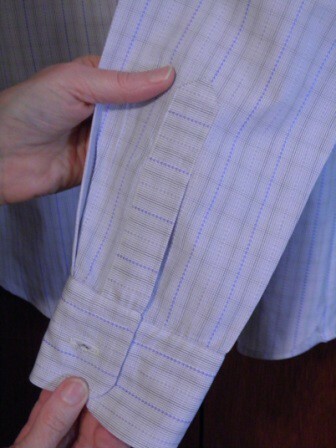 I folded (more like “rolled up”) the cut hem edges and stretched it under a zigzag stitch. It ruffled OK, but was kinda hard to handle and this process caused the fabric to run in a few places (yes, like pantyhose). 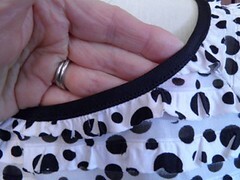 I don’t think it is going to really show since it is under a ruffle, but it still kinda bugs me. Anyway, I am pretty sure I am over-thinking this project. It’s going to get some hanging time in the closet and hopefully when I toss it on some morning I will just enjoy the fun abstract black dot fabric and ruffles. 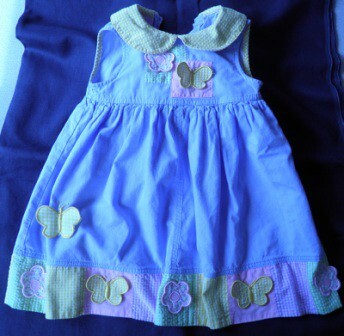 Doesn’t this dress just scream Easter and springtime? It is soooo sweet. 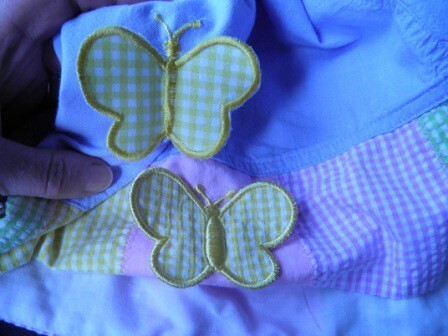 Too bad a certain little six year old decided to cut a hole right in the front of the skirt. Ouch! Remember my post the other day about trying to find yellow seersucker? Yep, it was for this repair job. It was a cinch to fix the cut in the skirt. 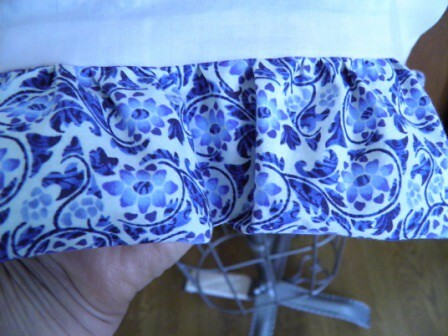 First, I ironed on some lightweight interfacing on the back side of the skirt over the cut to stabilize the fabric. Then I set my zig-zag stitch at a 4W and 1 or 1.5L, and stitched away. Happy sewing, and Happy Easter! 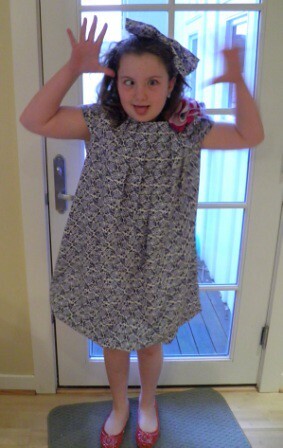 Here’s a shot of a very grown-up looking nine year-old. Seems like just yesterday when she was still a baby. 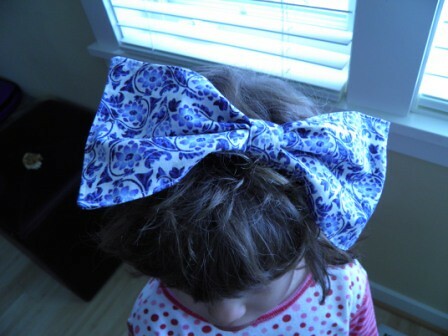 And of course, little sister had to at least try on the hair bow! My favorite nine year-old could have been the heroine for the princess and the pea. Anything that remotely scratches, binds, or touches can cause discomfort and “I’m not wearing that.” Fair enough, we all like to be comfortable in our clothing, for heaven’s sake. With this in mind, I picked a pattern without a defined waist (tummy is an especially sensitive area), bought some lovely soft blue print cotton for the dress, and lined it with pale pink cotton batiste to reduce any potentially scratchy spots (like zipper edges). Quick to make up. Pretty as a picture. Nicely finished inside. And a bubble skirt hem! What’s not to like? I’ll find out tonight, since all mothers know that our verdict about clothing does not always match the child’s assessment. Luckily, since I am not her mother I have a tiny (very tiny!) advantage and sometimes get a bit of a pass where her own mother would not. 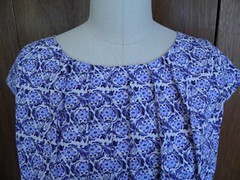 Here is a close-up of the front pleating, and the sweet little cap sleeves. I am going to try to get a flower pin made as well as a matching headband. A girl’s gotta be properly accessorized, after all. Wish me luck! Oye. Sometimes my timing is really off. I thought I had a fairly clear calendar when I signed up for the Birth of the Bustier class, but life has intervened and I am way behind. Today I finally managed to draft the moulage pattern based on my “bustier model” Jane’s measurements and the Kenneth King”Moulage” DVD. 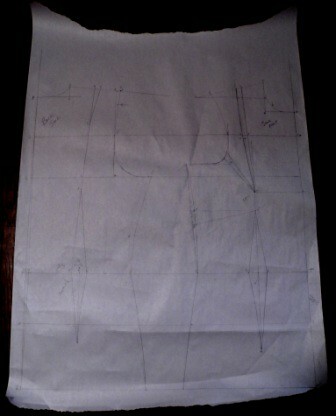 The purpose of this process is to create a “zero ease” fitting garment. 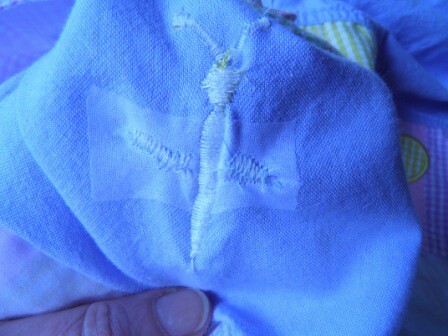 Tomorrow: stitch this baby up and have Jane try it on. Perfect any fitting issues, and establish the bustier design lines on the muslin. Maybe even start the bustier construction! Really? 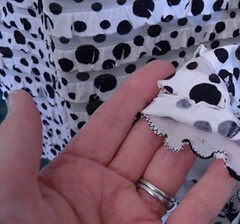 Seersucker is a gathered fabric? I didn’t know that! I always thought it was a lightly textured fabric that I think many would describe as “puckered”. 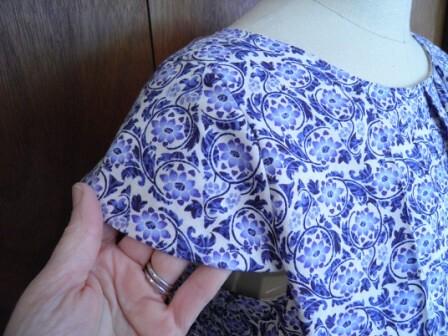 I certainly have not seen or used every kind of fabric in the world (tho I am working on it), but the gathered fabric that comes to my mind is the “pre-shirred” stuff used to make a quick sundress or top. 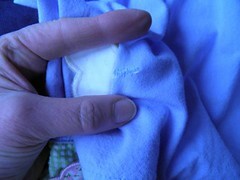 The second thing I learned from this short exchange was that you can substitue cotton gauze for seersucker. Cool! Honestly, Mrs. Hoover would be appalled. Sorry….gone gardening. We freakin’ finally have some sunshine in greater Seattle! Hey! I’m kinda excited! 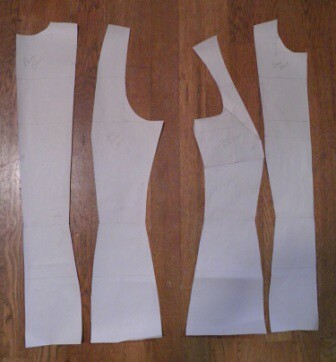 I signed up for my first online sewing class, The Birth of the Bustier, taught by Kenneth King on PatternReview. No worries, I am not making a bustier for myself – that would be a little too scary. I have a younger friend with a much cuter shape and she is my bustier model for this class. I have been intrigued by online classes before, but this is my first foray into this presentation method. How about you? 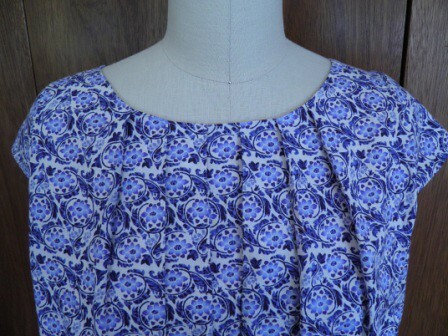 Have you ever taken an online sewing class? Ever wanted to try it out? I’d love to hear about your experiences, and I will definitely keep you posted on mine! Today I came across an article I thought contains more than a nugget of truth about my “lost mojo” problem. I’d be interested in your thoughts on this subject – send ’em my way!